What's better than a refreshing glass of lemonade on a hot summer day? Limeade with a twist! 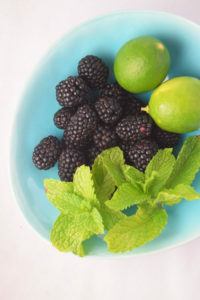 In a pot, bring blackberries, mint leaves, sugar & 1 cup water to a boil. Stir until the sugar is completely dissolved and the blackberries start to break apart. Using a wooden spoon smash the blackberries & mint and let it cool. Strain it discarding the solids. To it add remaining ½ cup water & lime juice. If you feel lot of more water evaporated during cooking, you can little more water. Stir it all around and taste for sweetness & tang. At this point, if you want, you can cover it and let it chill in refrigerator. Serve in glasses filled with ice and garnish with some fresh mint leaves and lime slices.